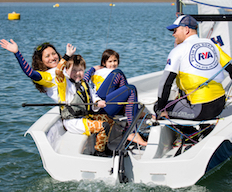 This month, nearly 50 clubs and centres in London and the South East are offering free sailing taster sessions as part of RYA Push the Boat Out 2018. Medway clubs known to be participating are Wilsonian Sailing Club (12 May), Elite Sailing (19 May), and Medway Yacht Club (19 May). This entry was posted in Dinghy sailing, Open Day, RYA, Sailing, Wind surfing, Yacht cruising by admiral. Bookmark the permalink.